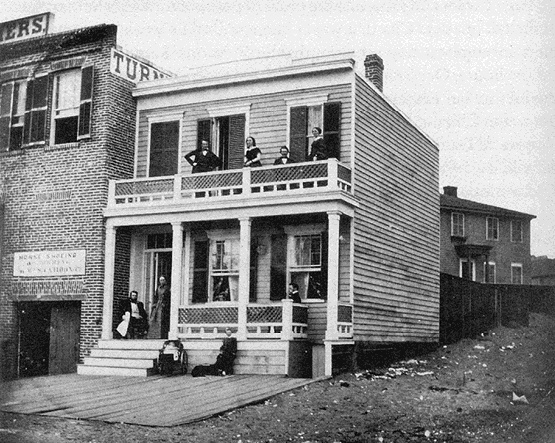 Rix house on north side of Market Street, between Kearny and Montgomery, 1855, Chastina and Alfred Rix on left side of porch. 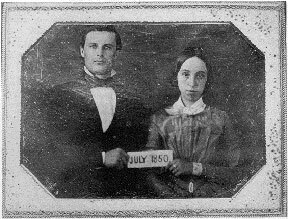 Alfred and Chastina Rix, 1850. The trip on the Pacific took fourteen days. At its end Chastina wrote: "Feb. 19, at about six o'clock in the morning I hurried on deck for we were then passing through the 'Golden Gate' a most beautiful sight. The sea was calm, the sun shining on the green hills, the morning mist & all looked so refreshing. Soon came the booming of the cannon [announcing the steamer's arrival]. Everywhere was bustle & preparation--beating & anxious hearts there were--as we neared the wharf of San Francisco. We are there." Now the same tale from Alfred's view: "Last Saturday, Feb. 19, a friend tapped me on the shoulder and suggested that the Golden Gate had got into port and had a passenger or two who would be pleased to see me. Of course I clapped on a clean shirt and left. I always expected to feel pretty nice when the folks got here, but as their arrival at this time was rather unexpected I felt so much the better. Now and then Chance, Providence, or Fortune has shown me an acceptable favor, and I have felt thankful for it and happy in its enjoyment, but this safe transfer of my little family from the Eastern to the Western border of the continent is the 'kindest hit of all,' and gives me more satisfaction than anything else I could ask for." In this letter to Roxana, Alfred made "one complaint ... of Mother and that is that she should let Chastina appear in California in such a shocking bad bonnet." At first the Rixes and Clara lived at the mission where Alfred taught school, but within two months, they began boarding near the center of San Francisco, just off Kearny Street. "The girls," as Alfred called Chastina and Clara, worked for pay. They took in washing and sewing, and like many other women in the city, added boarders to their household. Chastina took on an order from a local church to cover eighteen dozen buttons on pew pillows, which kept her busy for weeks. Vermont "boys" stopped by on their way to and from the mines, allowing the Rixes and Clara to catch up on home news as well as the activities of Dustan and the others in the gold country. They greeted the monthly mails with excitement, and when a steamer came without a letter from home, Chastina was greatly disappointed. Daily life in California differed greatly from Vermont. To begin with, Alfred was gone from the house all day-first as a teacher at the mission and later as a lawyer and justice of the peace, a position to which he was elected in the fall of 1853. Chastina was at home with 'the work': engaged much more in wage-earning activities than in Vermont. Some weeks she rarely left the house. Occasionally she and Alfred "took a walk up on top of one of the hills in San Francisco" or went to "Tobin's and Duncan's," an auction house for Chinese goods, or "to Cal. St. Wharf & Long Wharf Saw five clippers & Gambling Dens & men fighting." Chastina and Julian visited Alfred's law office once he set up practice on Montgomery Street, and she "did some copying" for him there. San Francisco was a booming town in the early 1850s with many new cultural and economic projects. Clara and her suitors often went to the 'Metripolitan Theater' and even Chastina and Alfred "saw Hamlet played by Mr. Murdock." One evening in spring 1854, Chastina and Alfred "went to the Musical Hall to hear a lecture from Mr Winslow on 'The Preparation of the earth for the intellectual races'." Chastina found it "a very scientific lecture, therefore good & interesting But it was hardly suited to the people of San Francisco." Alfred attended a meeting on the "great Pacific rail way," and he recorded in their journal the first telegraph service from San Francisco to San Jose. They went to an agricultural fair and described vegetables as "large as a man's leg." Alfred's law practice was successful, although he did not describe his cases in the journal as he had in Vermont where Chastina knew all the characters. Soon the journal stopped. They were increasingly busy and their daily routines became more separate. In an urban center with close to fifty thousand people, their lives overlapped only at home. They did not continue their Vermont pattern of attending meeting on Sunday. Chastina wrote that you had to be rich to be a churchgoer in California because those who attended wore expensive clothes. She and Alfred still recognized the day of rest on Sundays, although sometimes they recorded the fun they were missing by not breaking the Sabbath. Picking up their old habit of reading aloud, they were engaged by Dickens's Bleak House for several weeks. In 1854 Alfred bought land on the north side of Market Street, between Kearny and Montgomery, and at the end of the year, they built a two-story frame house with a front porch and second-floor balcony. Chastina wrote with pride about "our house," and she had Dustan, who had abandoned the gold mines, draw the layout of the first floor both inside and out for Roxana. The backyard especially "is perfect--You see we women have a good chance to 'gab' when we wish. Mrs. Plummer & Mrs Dagget come down the back stairs from their kitchens & I come out of my kitchen under the stairs." 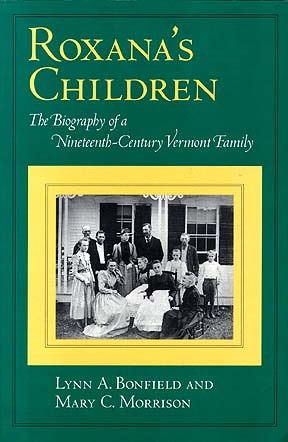 --excerpted from Roxana's Children: The Biography of a Nineteenth-Century Vermont Family by Lynn A. Bonfield and Mary C. Morrison (Amherst: 1995, University of Massachusetts Press).